Plastic is everywhere! It’s part of our every day lives- almost everything we own is either made from plastic or packaged in it! But we know so little about this material and its impact on our health and the environment around us. Inspired by one of our popular games in the Garbology 101 toolkit, we are tweaking the game for a stronger social impact. 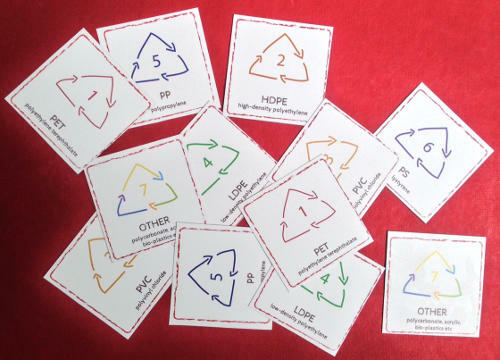 We are developing a fun, colourful and engaging memory-style game that raises awareness and educates everyone about plastics. It highlights which plastic resin codes are food grade, toxic or particularly dangerous for the environment and our health. It’s a game that will empower individuals to take concrete personal steps to create less waste, lead healthier lifestyles and pass on a flourishing, clean planet to future generations. Fundraised: INR 4,42,847 (INR 4,02,700 by Stichting De Zaaier & INR 40,147 by Auroville International Germany). If you would like more information about this project then please contact us.